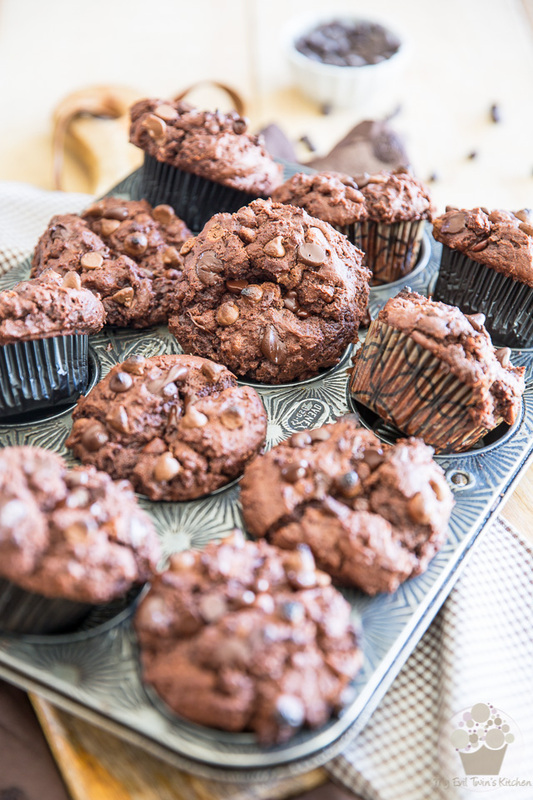 There is so much chocolate in these Chocolate Nutella Muffins, it’s ALMOST too much. 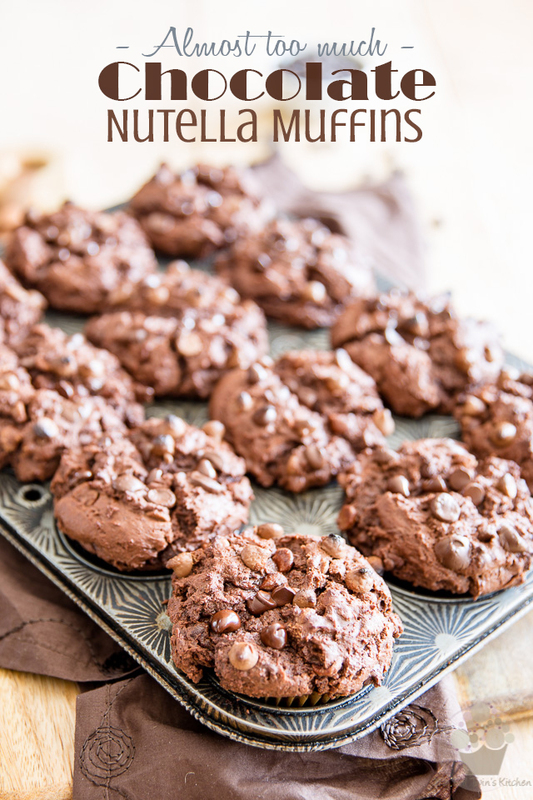 Will satisfy the toughest of chocolate cravings, guaranteed! I never thought that I would someday use the words “too much” and “chocolate” as part of the same sentence. In fact, I never even thought that these words COULD be used together. 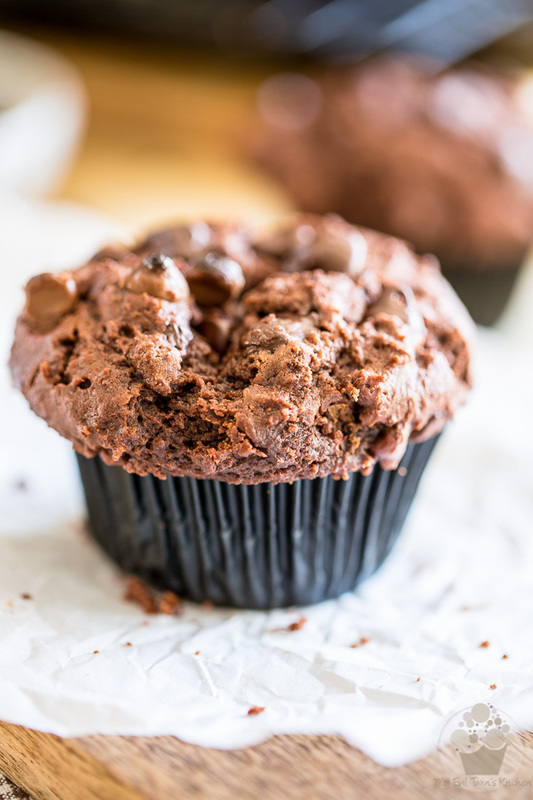 But that was until I got a taste of these Chocolate Nutella Muffins! They are so overloaded with chocolate, I swear, it’s almost too much. Hey, notice I said ALMOST. I can’t even find the words to describe just how truly indulgent and excessive these muffins are. You’re looking at a dense, toothsome and INTENSELY chocolate-y cake that’s loaded with a massive amount of not one, but TWO kinds of chocolate chips: milk and semi-sweet. 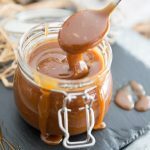 As if that wasn’t enough, it their center hides a totally ooey and gooey heart of soft and creamy Nutella. I’m telling you, your palate will get hit with chocolate on top of chocolate on top of more chocolate. A little friendly warning if I may? 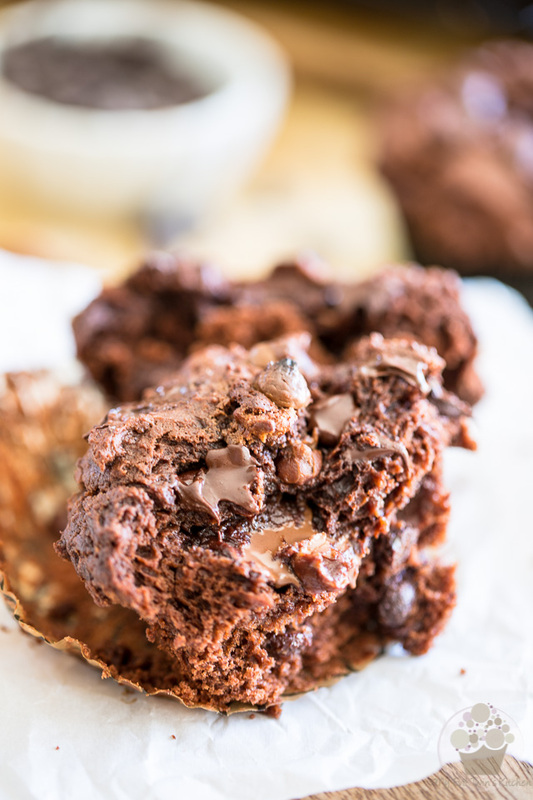 If you’re gonna eat one fresh out of the oven, or even slightly reheated, you’ll probably want to grab about 3 dozen napkins to wipe your face and fingers, because that melted chocolate just oozes from all over the place. 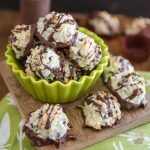 If you’re in need of a chocolate fix today, these will DEFINITELY get you covered, and then some! 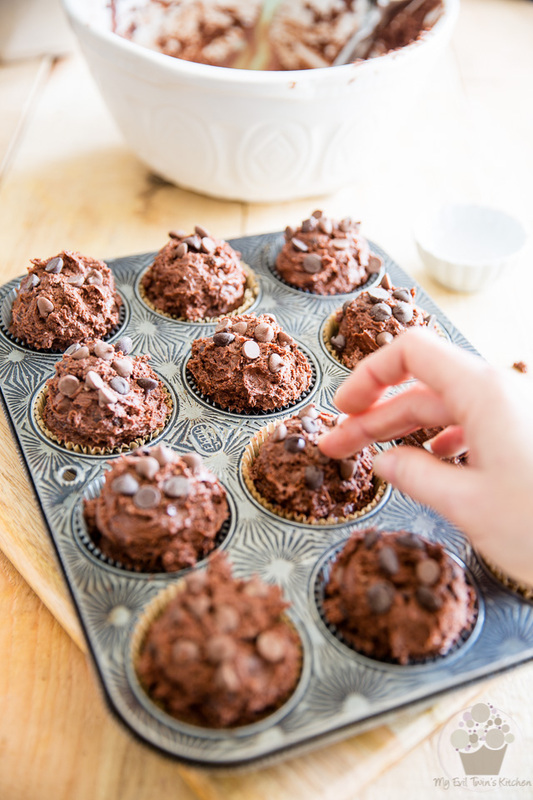 Start by preheating your oven to 425°F and then line a 12 cup muffin pan with standard paper liners. Also, line a jelly roll pan with parchment paper. 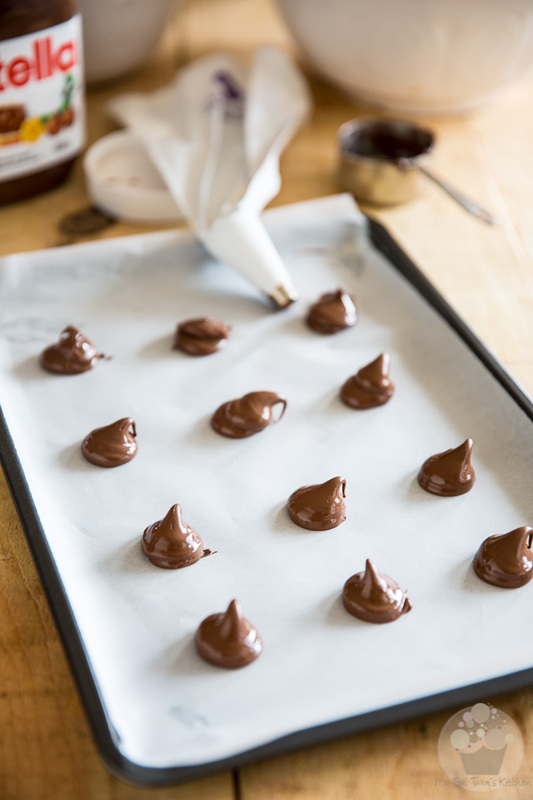 Equip a 12″ pastry bag with a medium sized round tip and place 1/3 cup of Nutella in the bag. Pipe 12 dollops of Nutella onto the parchment paper and place in the freezer to harden. 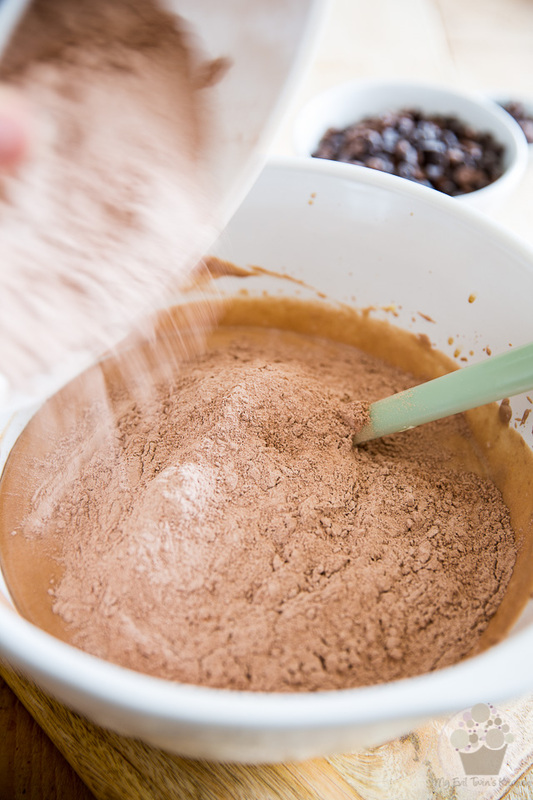 In a large mixing bowl, combine the flour, cocoa powder (don’t forget to sift it first! ), baking powder, baking soda and salt. Stir well with a whisk until evenly combined. 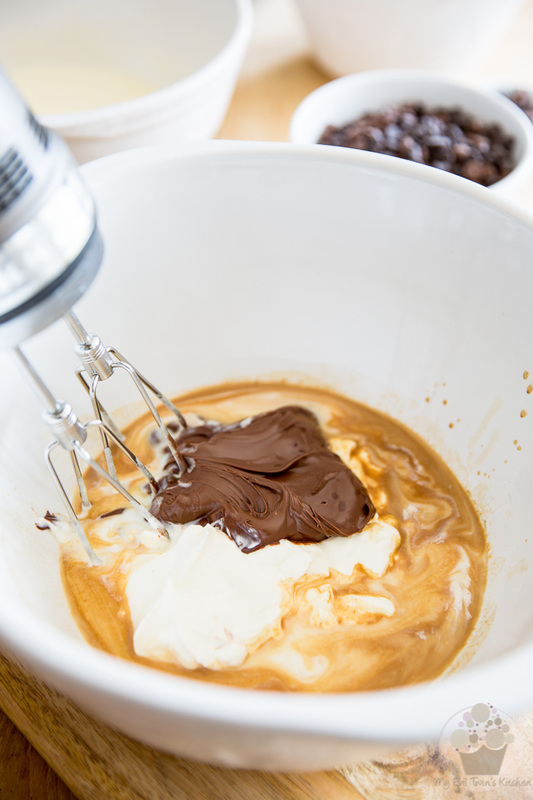 In another bowl, combine the sour cream, buttermilk, Nutella and vanilla extract. Melt the ghee (or measure the oil) in a separate bowl. 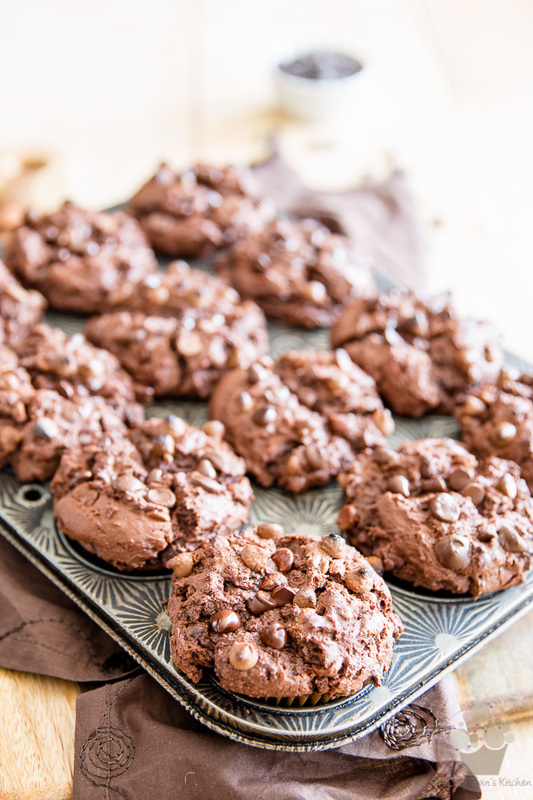 In yet another bowl, combine your semi-sweet and milk chocolate chips together, mix well and put a handful or two aside to garnish your muffins. Finally, place the sugar in a large mixing bowl and take 2 eggs out of the fridge. 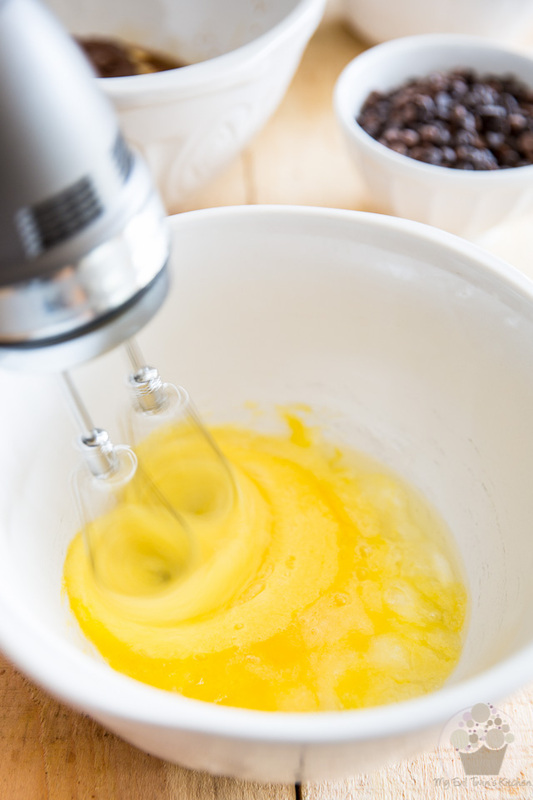 Add the eggs to the bowl that has the sugar in it and mix on high speed with an electric mixer. 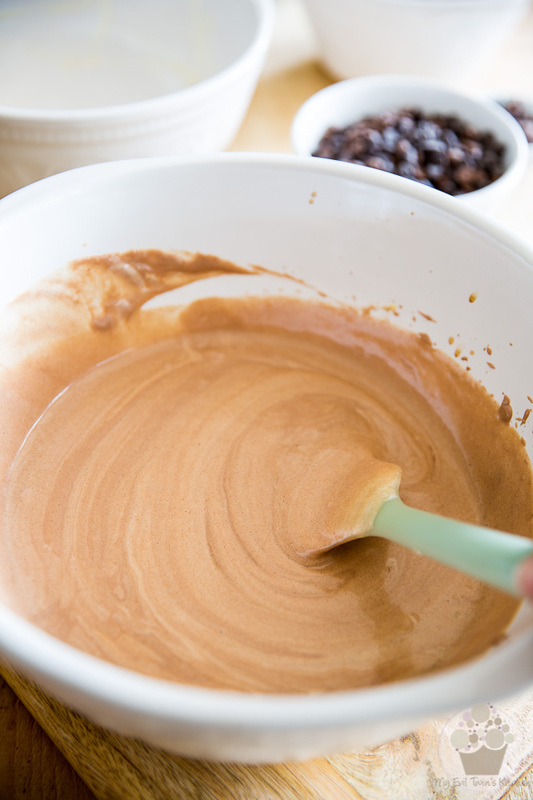 Keep mixing until the mixture becomes pale and is nicely thickened, about 5 minutes. 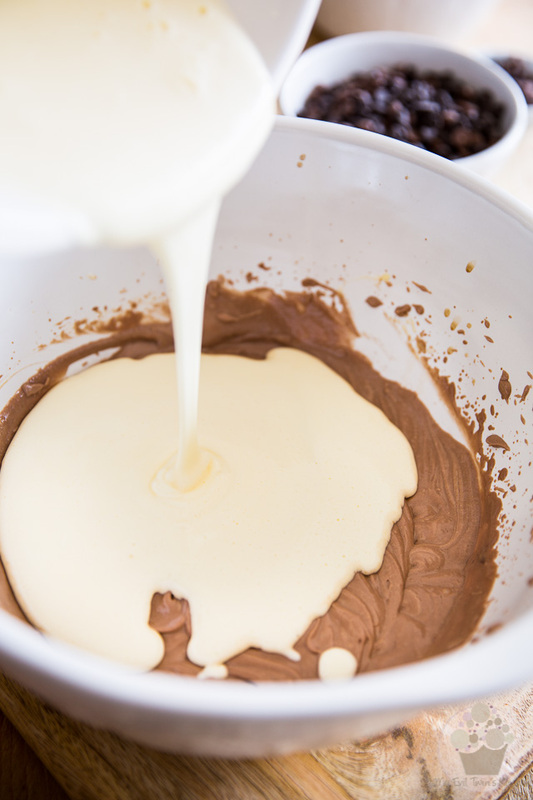 Now grab the bowl with the sour cream, buttermilk, Nutella and vanilla extract. 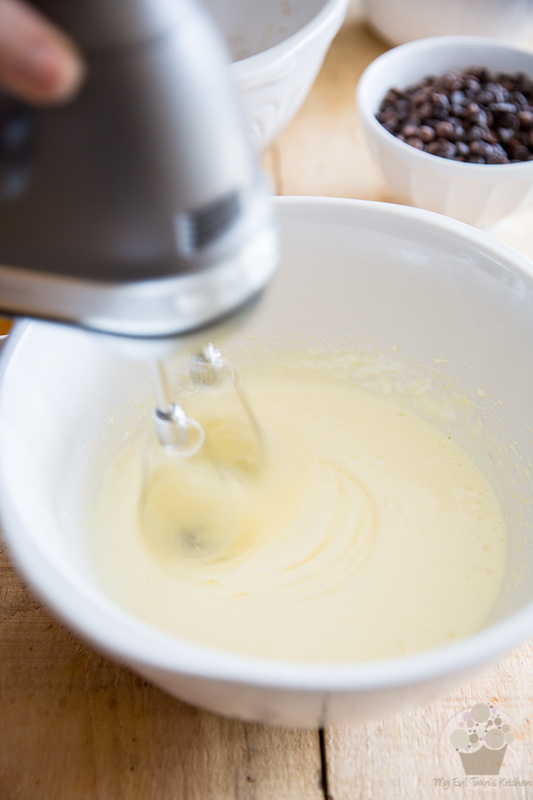 Mix on high speed with an electric mixer until well combined. And resume mixing until fully incorporated. You can put that electric mixer away now, we’re not going to use it anymore. …and delicately fold it in with a rubber spatula, until just incorporated, no more. See the streaks in my batter? That’s perfectly fine! We’re not quite done mixing anyway. It’s now time to add the the dry ingredients to the wet. 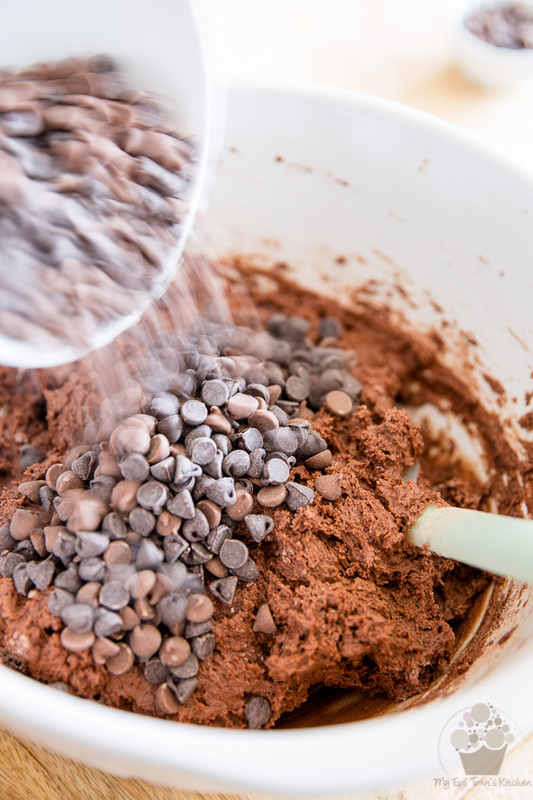 Mix delicately until the chocolate chips are evenly distributed. Okay, before you go any further, if you’re a fearless fan of raw cake and cookie batter, you HAVE to have a taste of this one. Like right now. Seriously, if there’s one batter that I would totally consider making just so I could eat it by the spoonful, without even intending on cooking it ever, this would be it right here. This stuff is so good, I came this close to not even finishing the recipe and simply run to the living room, bowl and spoon in hand, to wolf the whole thing down. But I had to sacrifice myself and go on with the recipe, for the good of this blog… Ah, the sacrifices I make for this place! 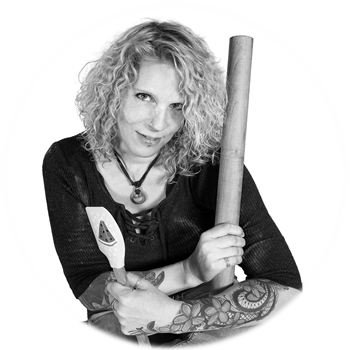 Okay, now that you’ve had a chance to feast on that raw batter, (you didn’t eat the whole thing now, did you?) 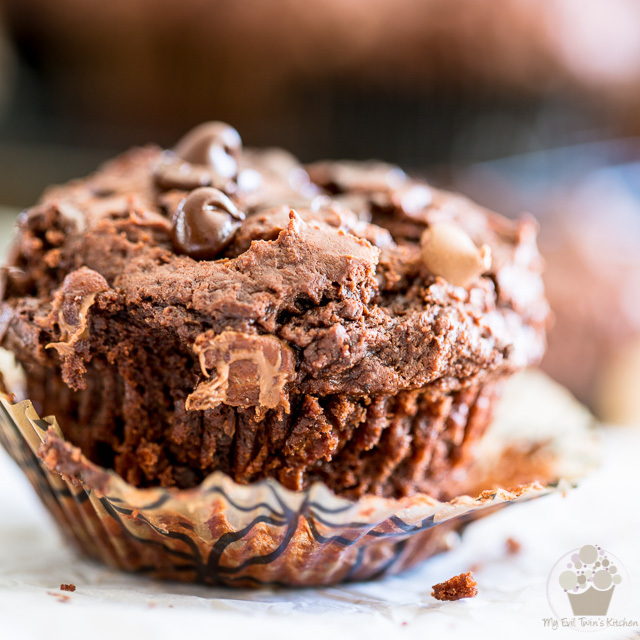 fill each muffin cup about half way up and then press a dollop of frozen Nutella right in the center of each muffin. Now divide the rest of the batter between the 12 muffins. 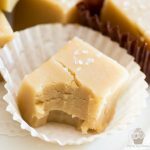 You’ll probably think that you have way too much (unless you couldn’t control yourself and already ate half of it by now), but trust me, you don’t. 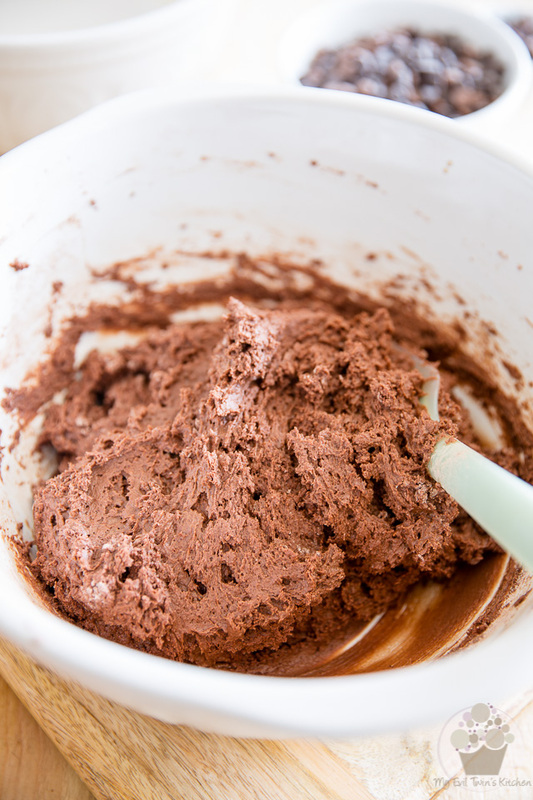 Scoop that batter right over the Nutella, making sure to press it down a little bit to help seal that Nutella in. As you can see, you will have to mound that batter quite high, and that’s perfectly fine. As much as you can, try and shape your batter into pretty little domes, though. 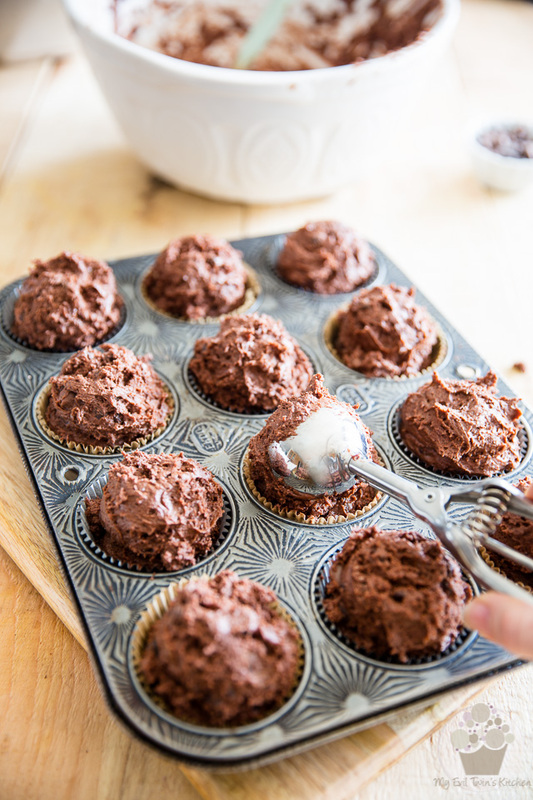 This will help the tops of your finished muffins look their best! A large spring-loaded ice cream scoop works wonders for this, so if you have one, now would be a good time to take it out. If you don’t have one yet, you should seriously consider investing in one (or even 2 or 3 of different sizes). These things are so incredibly handy, you’ll be happy to have them as part of your kitchen arsenal. And we’re almost done. All that’s left to do now is press a few chocolate chips into each muffin and then we can send the pan to the oven. Bake the muffins for 5 minutes at 425°F and then lower the heat to 350°F. And now for the real tough part: let the muffins cool in the pan for about 30 minutes and then remove them to a wire rack to cool completely. If you tried to take them out of the pan too soon, they would completely fall apart… there’s simply too much ooeyness and gooeyness inside these bad boys for them to keep it together when they’re just out of the oven. Besides, eating one of these bad boys when they’re still fresh out of the oven is an experience you just can’t miss out on. And now, for the coup de grâce… you did grab those napkins, didn’t you? 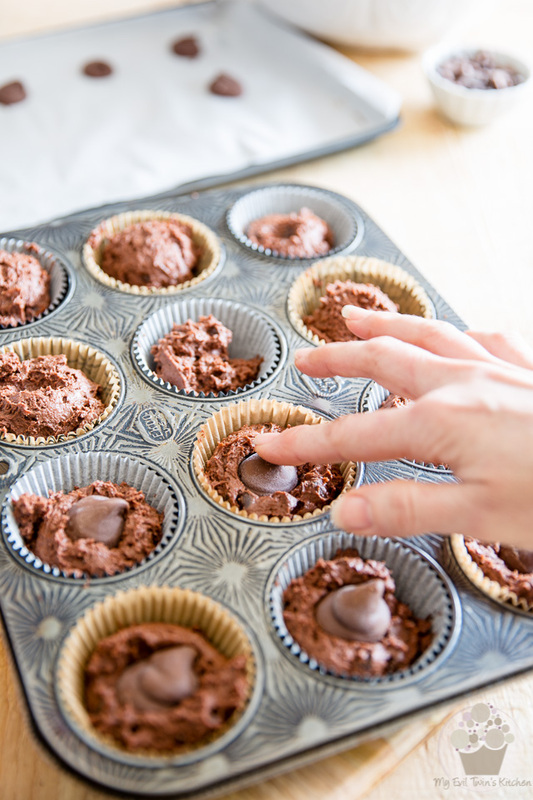 Preheat your oven to 425°F; line a 12 cup muffin pan with standard paper liners. 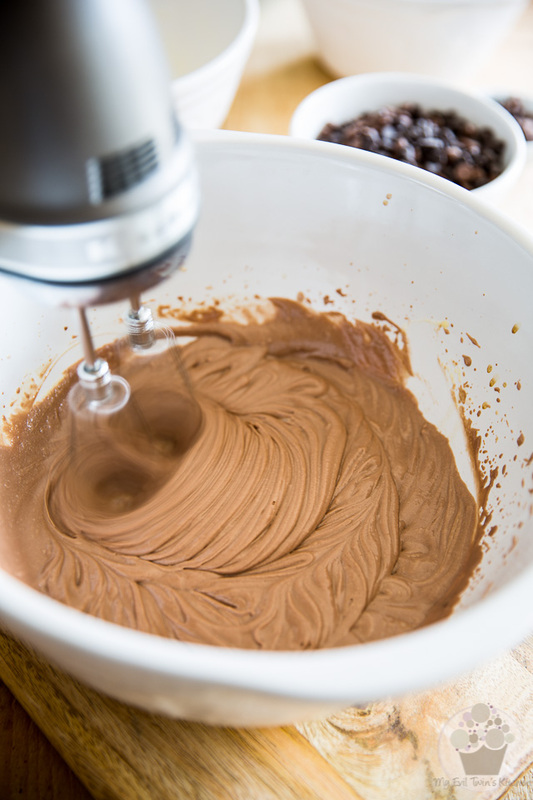 Equip a 12" pastry bag with a medium sized round tip and add 1/3 cup of Nutella to the bag. Pipe 12 dollops of Nutella onto the parchment paper and place in the freezer to harden. 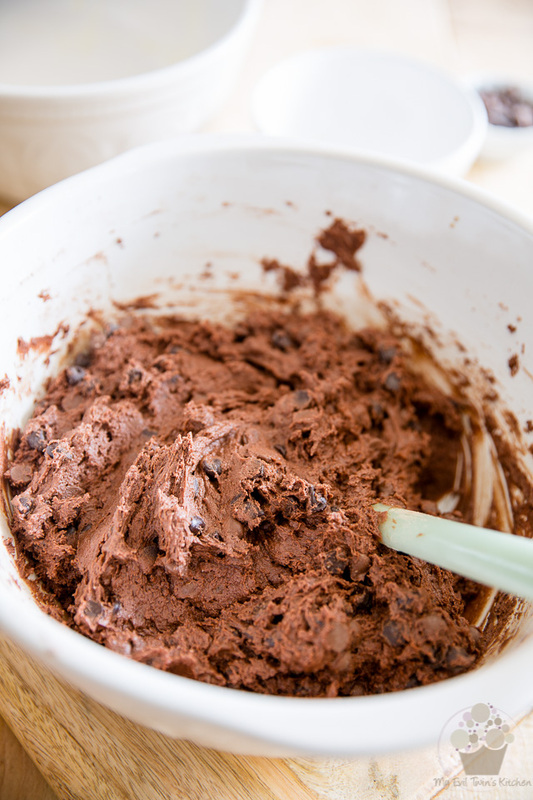 In a large mixing bowl, combine the flour, cocoa powder, baking powder, baking soda and salt. Stir well with a whisk until evenly combined. In a separate bowl, beat the eggs and sugar on high speed until the mixture becomes pale and thickened, about 5 minutes. Reserve. 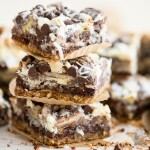 In a 3rd bowl, combine the sour cream, buttermilk, nutella and vanilla extract. 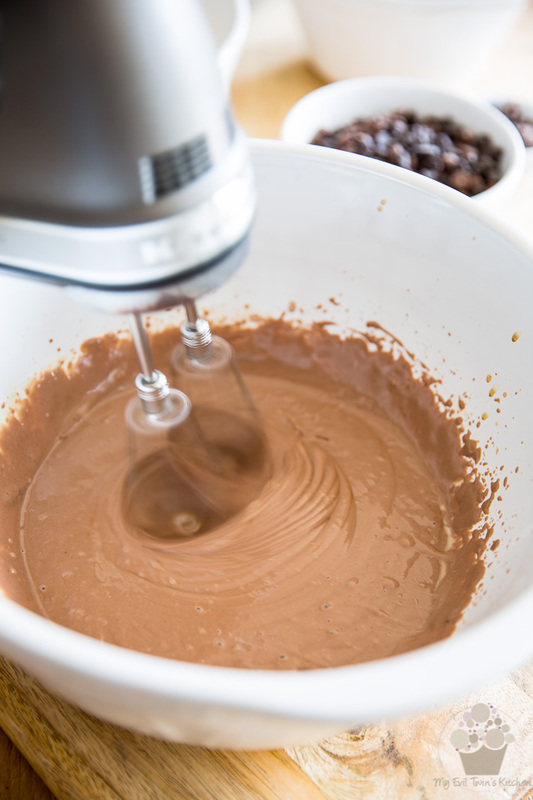 Mix on high speed with an electric mixer until well combined. 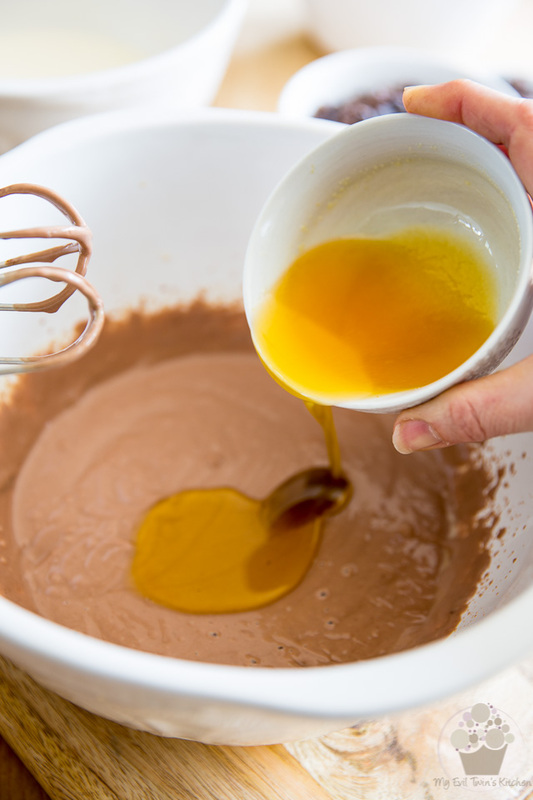 Beat in the melted ghee (or oil) until fully incorporated and then add the reserved egg mixture. Delicately fold it in with a rubber spatula, until just incorporated, no more. 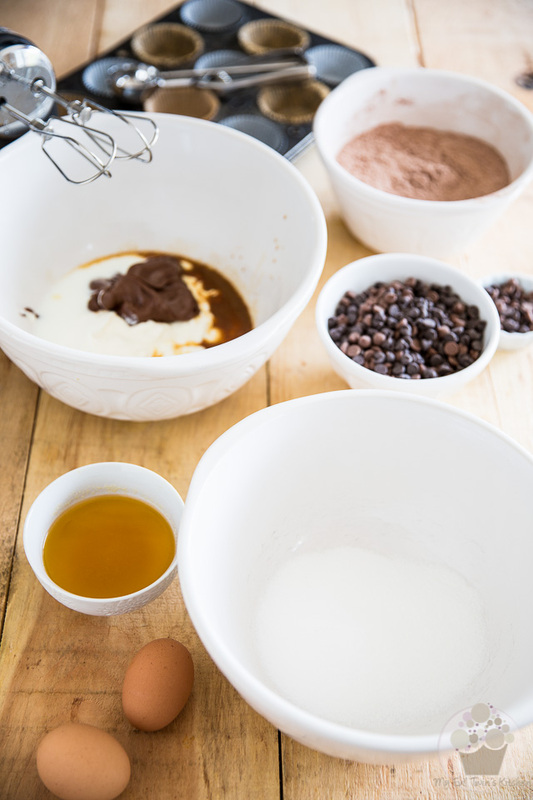 Add the dry ingredients to the wet and fold them in delicately with the spatula until barely blended, then throw in the chocolate chips (don't forget to save a handful of each kind to garnish the tops of your muffins) and mix delicately until all ingredients are evenly combined. 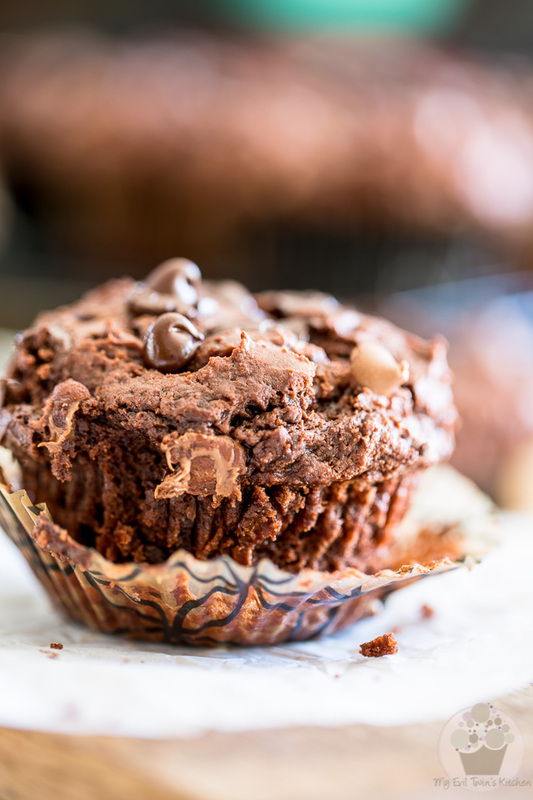 Fill each muffin cup about half way up and then press a frozen Nutella dollop right in the center of each muffin. Cover with the rest of the batter, making sure to press it down a little to seal help seal the Nutella in. You will have to mound the batter way higher than the paper cup, that's perfectly fine. Try and make pretty little domes, if you can. A large spring-loaded ice cream scoop works wonders for this! 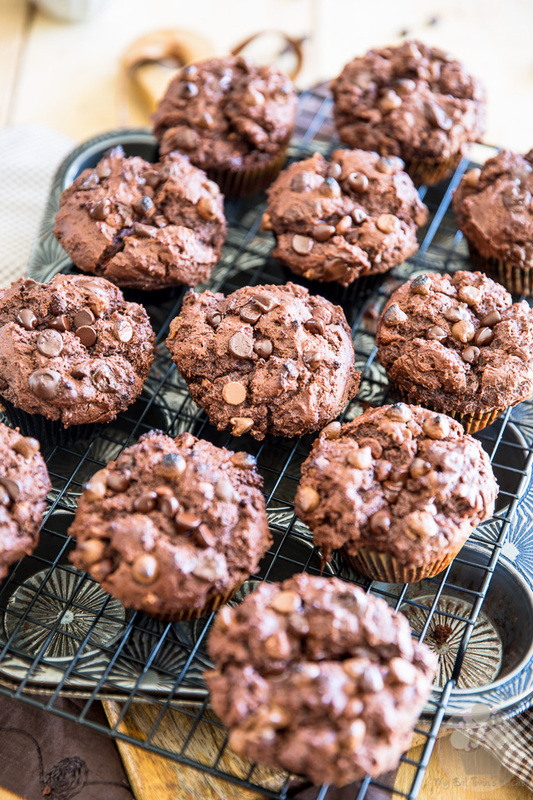 Press a few chocolate chips into each muffin and then send the pan to the oven. Let the muffins cool in pan for about 30 minutes and then remove them to a wire rack to cool completely. 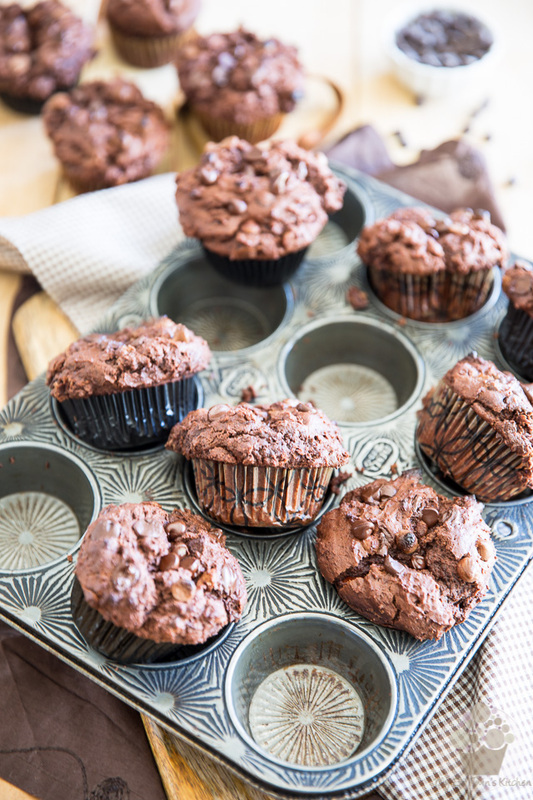 Store your muffins in an airtight container at room temperature for up to 5 days. Sonia, you’re making it very difficult for me to avoid gluten! This is the dreamiest muffin I’ve ever laid eyes on and it will be finding it’s way into my mouth on my upcoming birthday! I notified my family that I didn’t want any birthday treats, however, I think a change of plans are in order here!